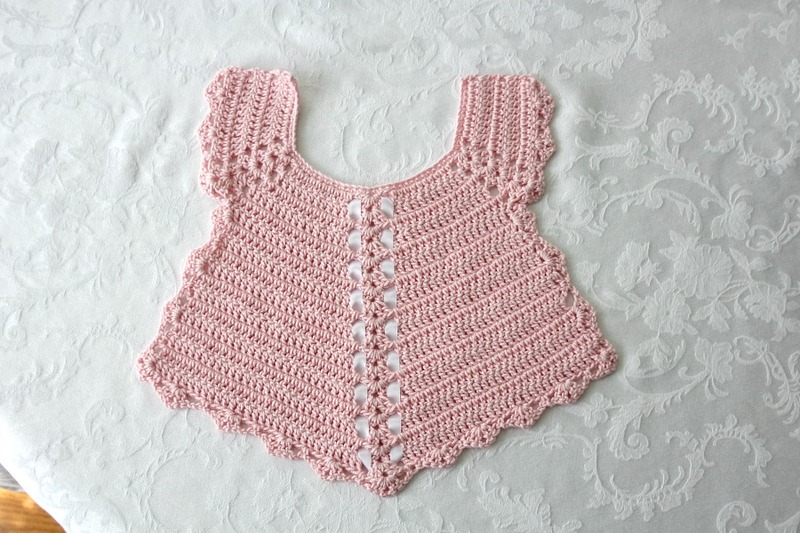 This sweet crochet baby bib is adapted from a vintage pattern and perfect for a toddler. 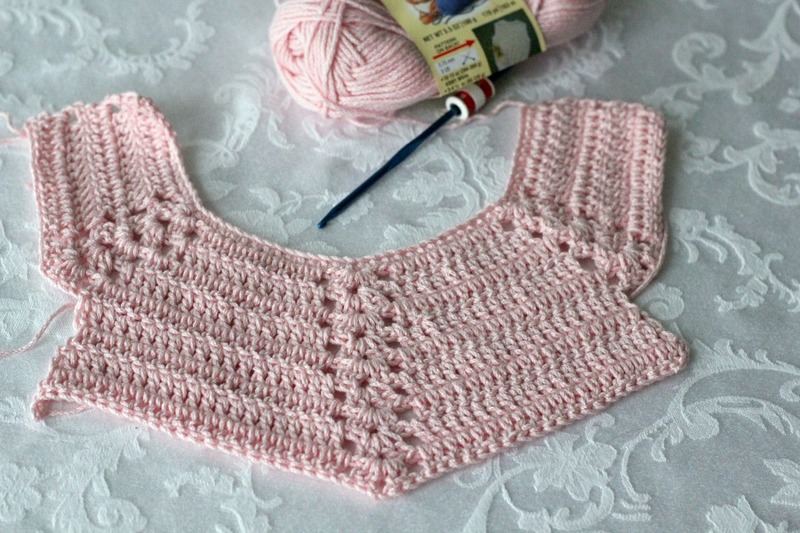 Almost too pretty to use as a bib but adorable to dress up an outfit. 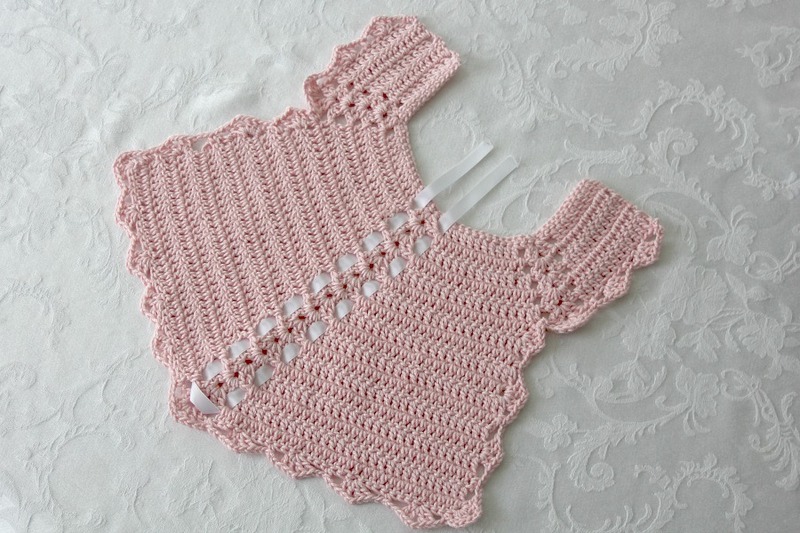 Using a pattern from my husband’s, Aunt Marie, I made a crochet baby bib for little Chloe. Our sweet baby girl is just getting the hang of walking. Aunt Marie liked to crochet too. 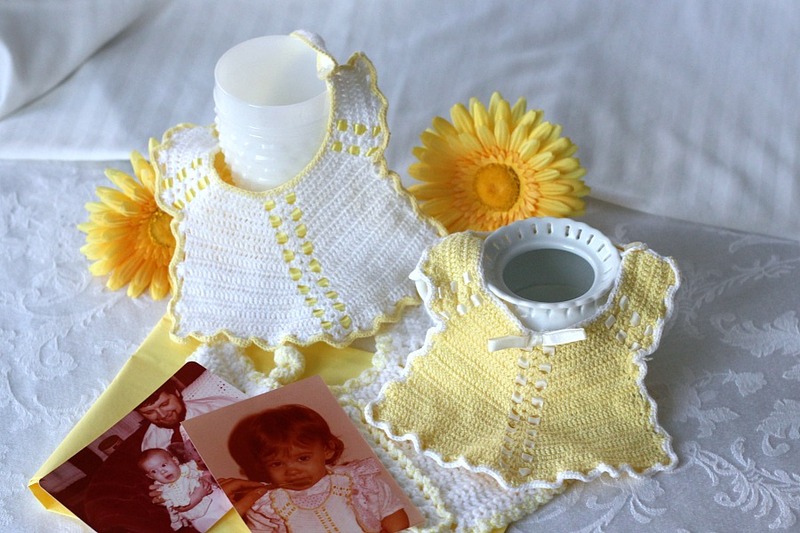 She made these two little cotton bibs back in 1978 for our oldest daughter, Erin. 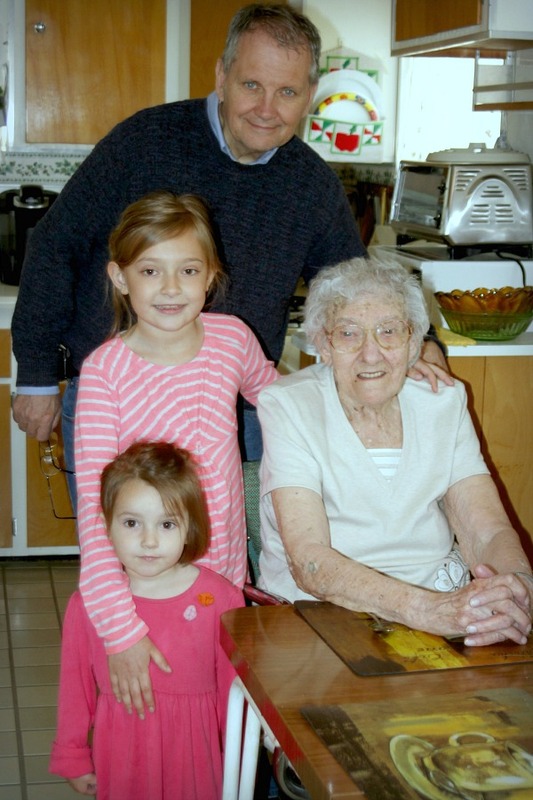 Last month, we took Chloe’s, older sisters, Keri and Cambrie with us to visit Aunt Marie who will be celebrating her 96th birthday in June. I brought my work-in-progress along to show her. 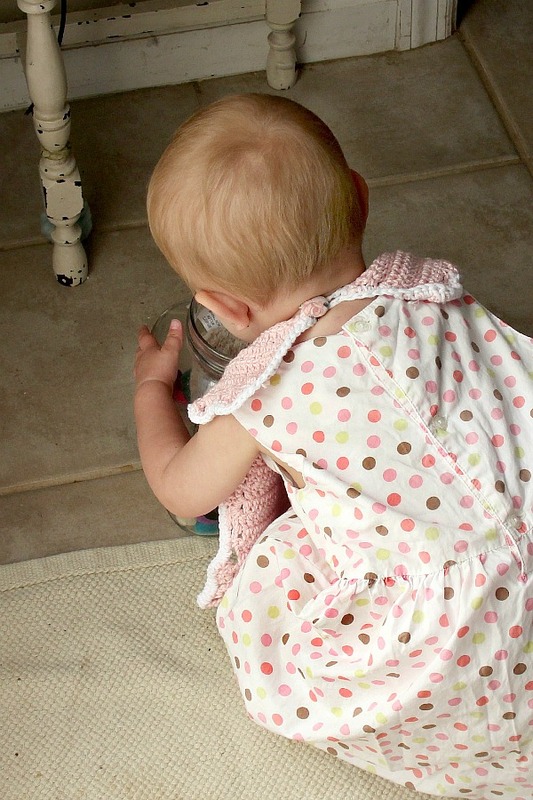 These photos show the progress of this larger, slightly adapted baby bib. As you can see, my bib is much larger than the one Aunt Marie made. 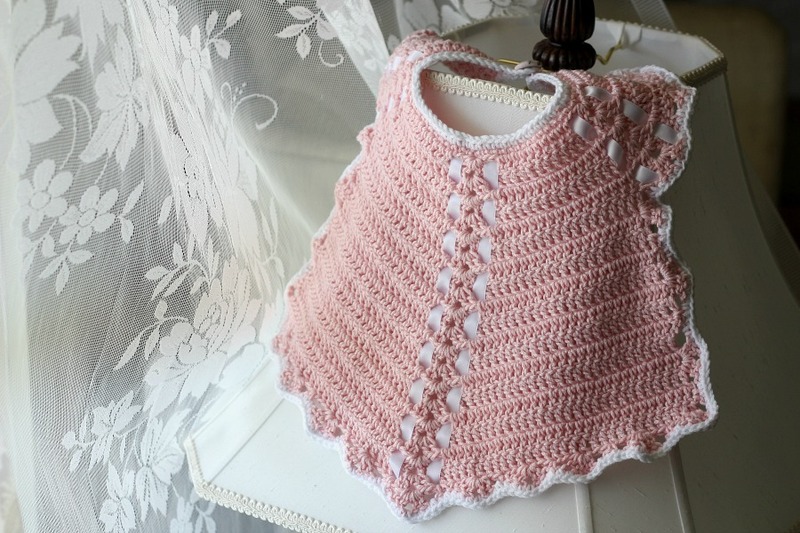 I used TLC Cotton Plus (color: light rose) and F crochet hook, so the finished size of my bib is much larger than the original pattern bib (below). *Knit-Cro-Sheen is a registered trademark of the Coats & Clark Co. Starting at Neck with White, ch 56. Row 1: Sc in 2nd ch from hook and in each ch across. ch 3, turn. Row 2: Skip first sc, dc in next 9 sc, *ch 1, skip next 2 sc, in next sc make 2 dc, ch 2 and 2 dc (shell made); ch 1, skip next 2 sc, dc in next 10 sc. Repeat from * across. Ch 3, turn. Row 3-6 : Skip first dc, *dc in each dc across to next ch 1 sp, dc in sp, ch 1, shell in sp of next shell (shell made over shell), ch 1, dc in ch 1 sp. Repeat from * across. Dc in top of turning chain. Break off at end of 6th row. Turn. Row 7: Attach White to first dc following first shell on previous row, ch 3, dc in each dc across to next ch 1 sp, dc in sp, ch 1, shell over shell, ch 1, dc in next ch 1 sp, dc in each dc across to next ch 1 sp. Ch 3, turn. Work in pattern until 19 dc rows in all are completed. Break off. Row 1: Attach White to top of turning chain at beginning of 6th row, sc in same place, (ch 2, skip next 2 dc, shell in next dc, ch 2, skip next 2 dc, sc in next sc) twice; ch 2, shell over shell, ch 2, sc in base of first st on 7th row, (ch 2, skip next row, shell in end st of next row, ch 2, skip next row, sc in end st of next row) 3 times; ch 2, skip next row, in end st of next row make (2 dc, ch 2) twice and 2 dc; (ch 2, skip next 2 dc, sc in next dc, ch 2, skip next 2 dc, shell in next dc) 5 times; ch 2, sc in first dc of next shell, ch 2, shell over same shell, ch 2, skip next dc of same shell, sc in next dc, ch 2, shell in next dc, ch 2, skip next 2 dc, sc in next dc. Complete row as for other side. Break off. Attach Blue to first sc on previous row, sc closely around entire Bib. Break off. Starting at center with White, ch 44. Row 1: Dc in 4th ch from hook and in each ch across, ch 6 for buttonhole, working along opposite side of starting chain, make dc in each ch across. Break off. Row 2: Attach Blue to first st of previous row, sc in same place, sc in each dc across, 7 sc in ch 6 sp, sc in each remaining dc across to end of row. Break off. Sew strap in place. Sew button to other side to correspond. 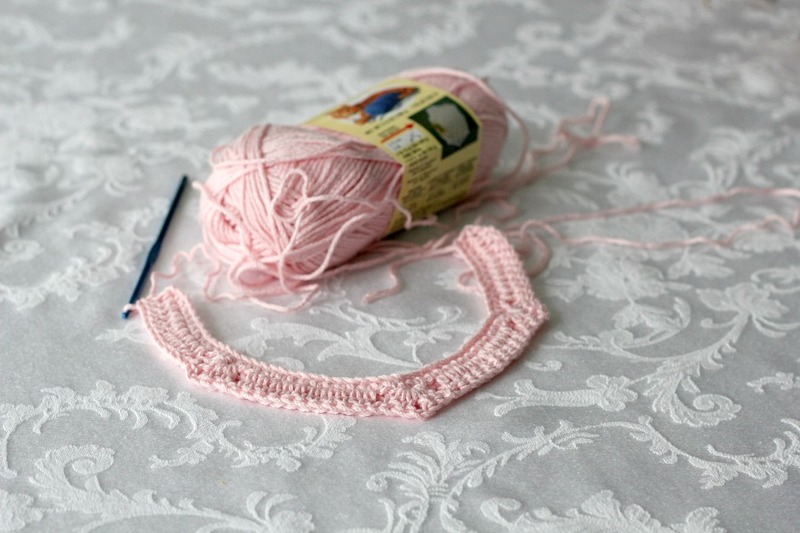 Cut 2 pieces of ribbon 4 inches long and lace through sps at each side of bib. Sew ends in place. 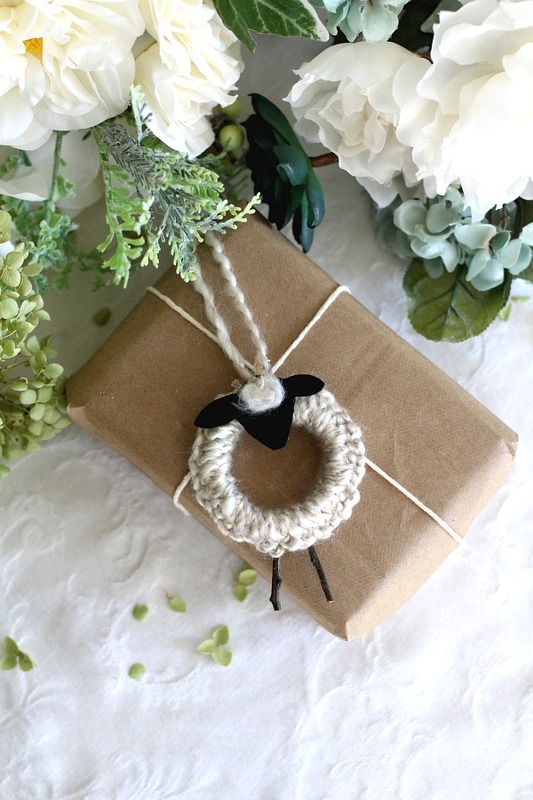 Lace remaining ribbon through spaces at center and tie into a bow at top. Here is the completed baby bib. Reminded me of great grandma. Thank you for sharing the pattern. I made it and love it; can’t wait to made a couple more. 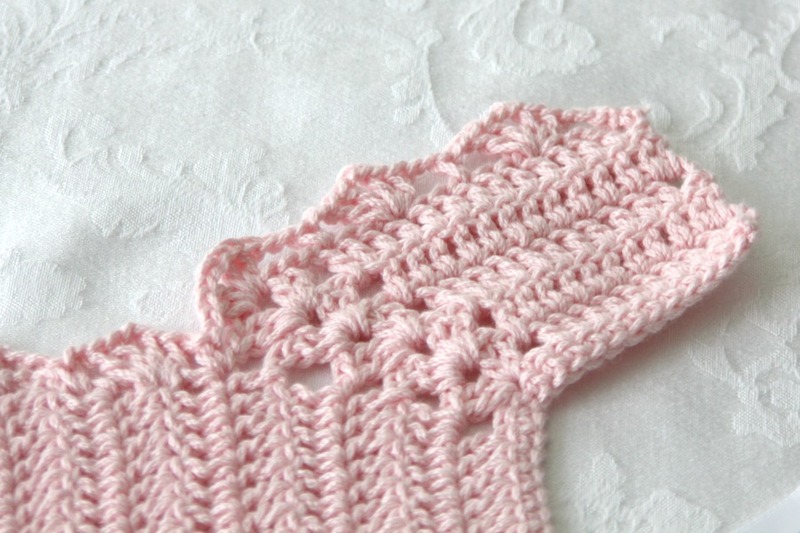 I looked this pattern up online in hopes of finding something "close" to the one I have made for many babies throughout my lifetime including my grandaughter, Chloe. 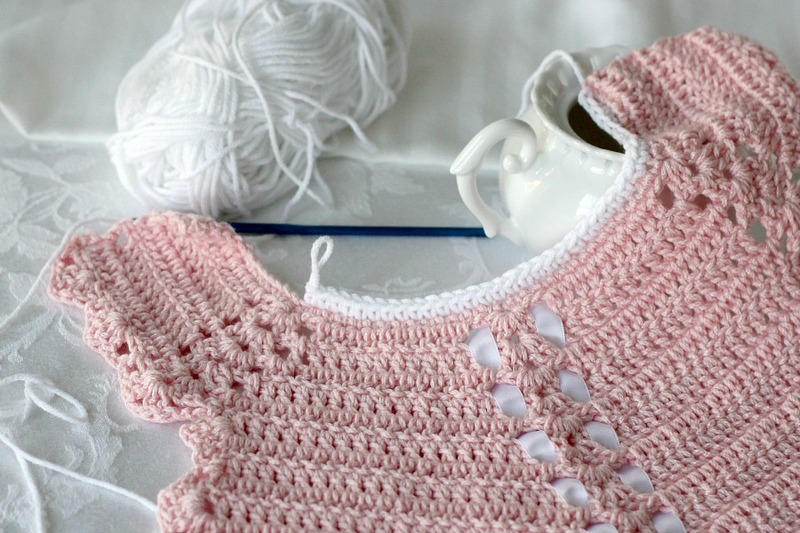 My original pattern came from my dear mother, whose limited funds made it necessary to create crocheted, sewn and embroidered clothing for her nine children as well as countless others. The years of use by my mother and myself have left the original pattern books rather tattered and fragile. 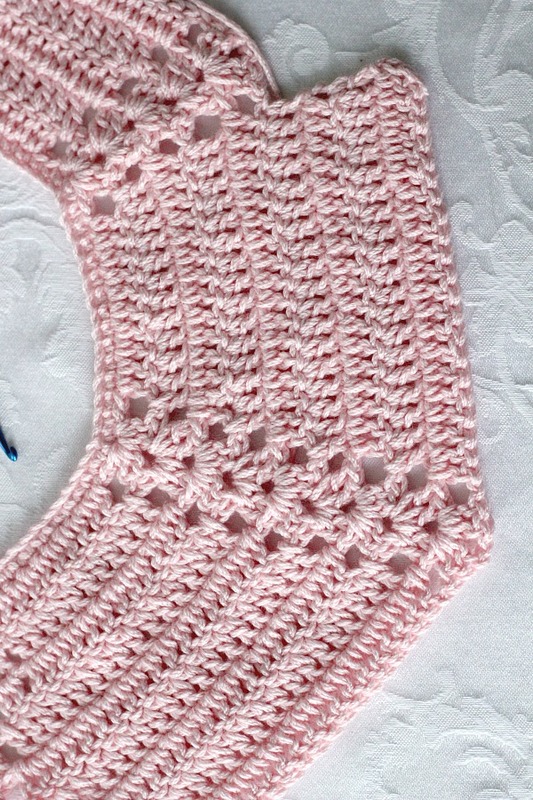 I want to thank you for sharing the pattern that is identical to my moms and for version that you created for your beautiful Chloe. I plan to follow your wonderful advice and make some for new babies coming into my family this year! Thank you and bless you and your family! 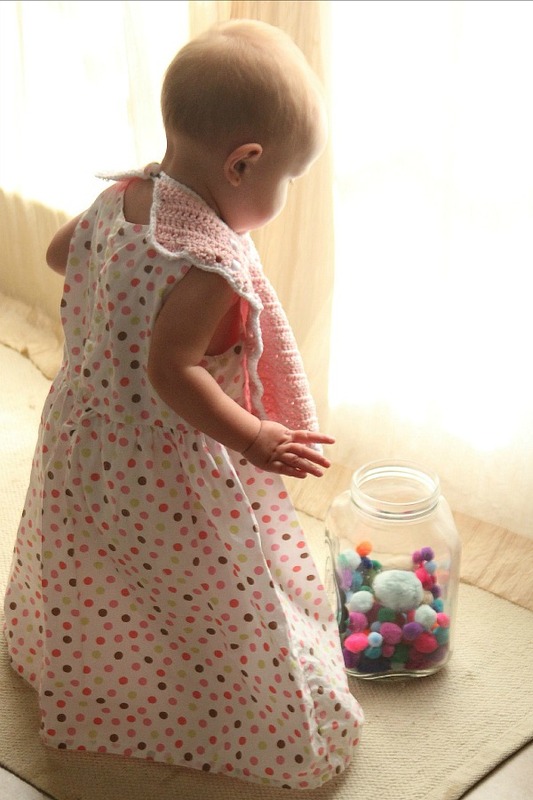 Beautiful bib, dress and girl and what a lovely idea to crochet a vintage pattern to celebrate a ripe old age! The bob came out truly beautiful and Chloe well, shes just beyond precious! Such a lovely Bib and post. The bib is adorable. What a treasure. I LOVE this bib! 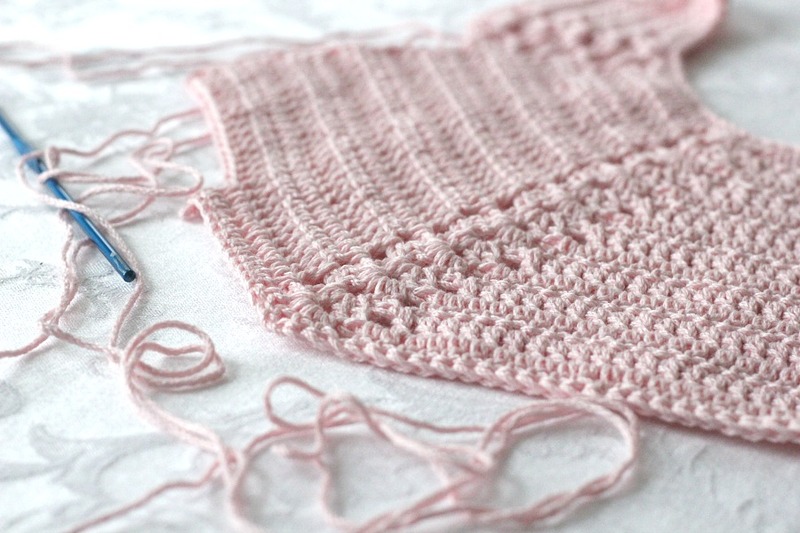 It reminds me of a sweet, little bib my dear mother-in-law crocheted for my sweetheart. 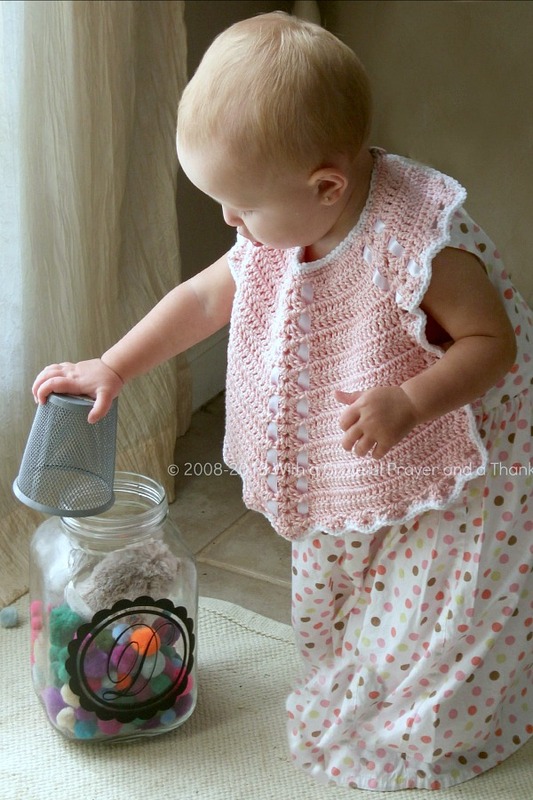 I still have that bib and you've inspired me to follow your pattern to make one for my youngest granddaughter. Thank you for the inspiration and the pattern. That is the most prettiest bib I've ever seen. Wonderful work! New Follower. Would love for you to share at Simple & Sweet Fridays. That is adorable. I miss babies here. I just want to pick up that sweetness and give her a kiss. Awesome work! dear Lorraine. How so talented you are….! Love little Chloe's precious baby face and oh, those pierced ears! Tooo sweet! The bib is just beautiful and Chloe makes it even more so. I could NOT do that! It's beautiful but oh my, the work. 🙂 My favorite grandmother used to crochet some incredibly beautiful items…she rarely even looked at the needle. Thanks for the wonderful memory! Chloe is a beautiful baby! The last photo with her holding the flower is definitely frame worthy! 🙂 Can you even stand for her to go home? what a great idea! it's very beautiful! Hi there, Firstly, Chloe is adorable!!!! 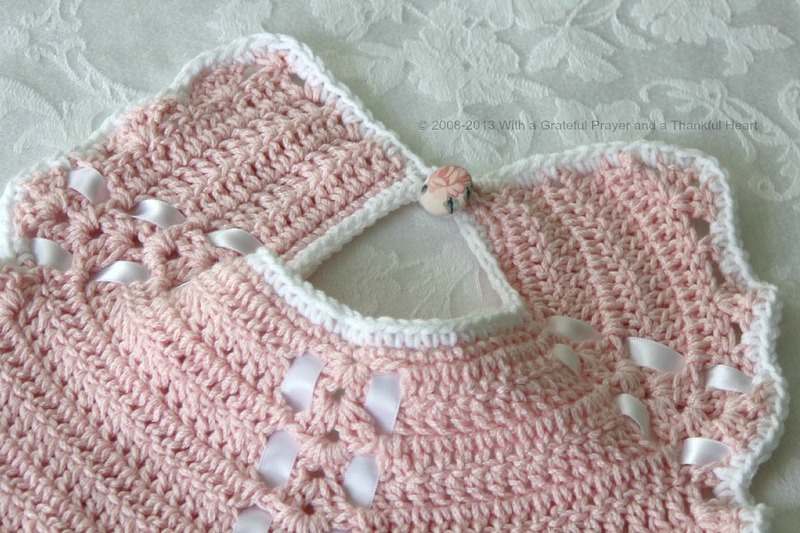 I love this bib-so sweet and delicate. 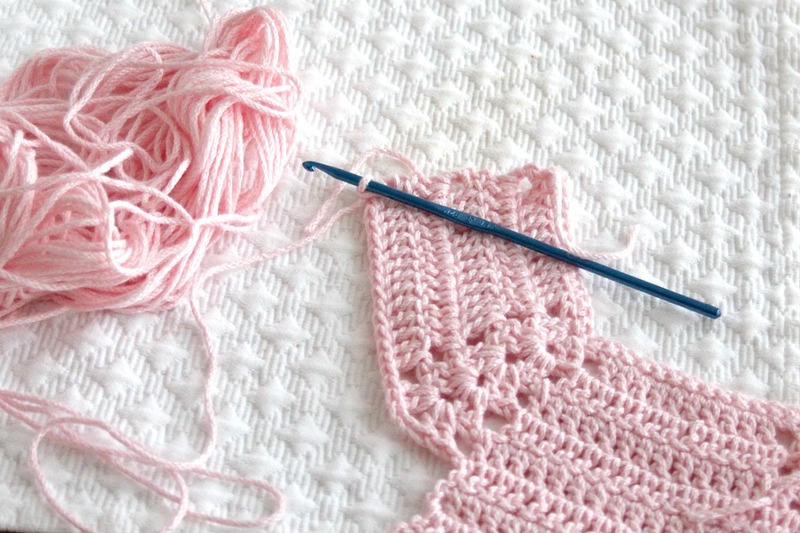 My daughter knits and I'm sending her a photo so she can try to make one for a family's little one. I love the color-it is just perfect. Seeing your aunt was very special-how blessed you are to still have her. Oh, my goodness, that is so beautiful. She should just wear it with her clothing as an accessory. What talent! So totally sweet! And the pattern too! Love how it's continued through the generations. It looks like you had a wonderful mother's day with one on one time! I clearly remember my grandma having a bib like this, although she would have been thrilled to have such a pretty one like you did. 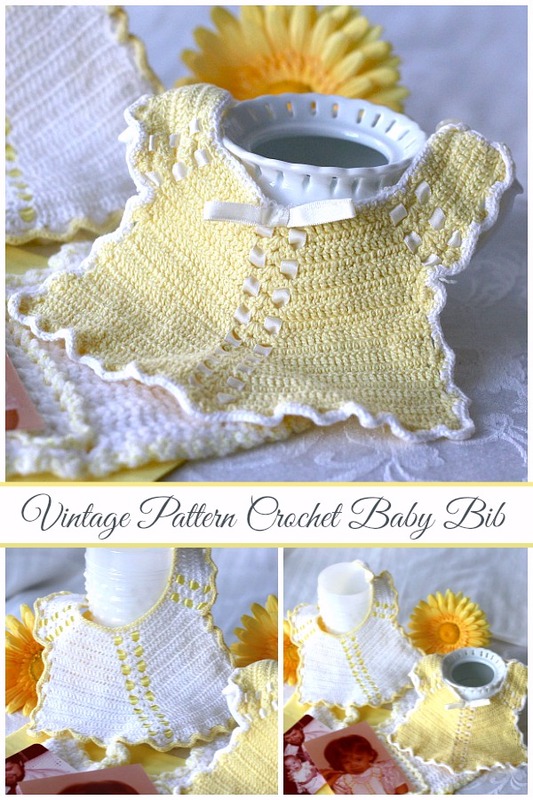 I like anything vintage, but I must admit, this is one of the most beautiful bibs I have ever seen. Thanks so much for sharing the time and skill you put into this for sweet little Chloe. Precious Chloe is darling in this bib. God bless Aunt Marie. Her crochet for Erin is gorgeous, too. I know she was thrilled to see your work, as well. Every photograph you take looks like it belongs in an expensive magazine. You are very talented. That is the prettiest bib I've seen. 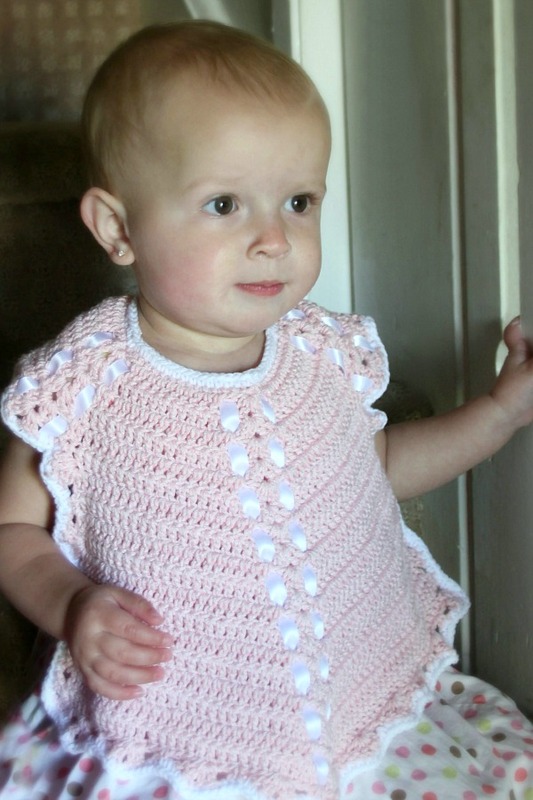 I love the color and it looks so sweet on your little granddaughter. You really do beautiful work. I bet Aunt Marie was so proud. I love the bib. Your grandaughter looks so sweet in it. 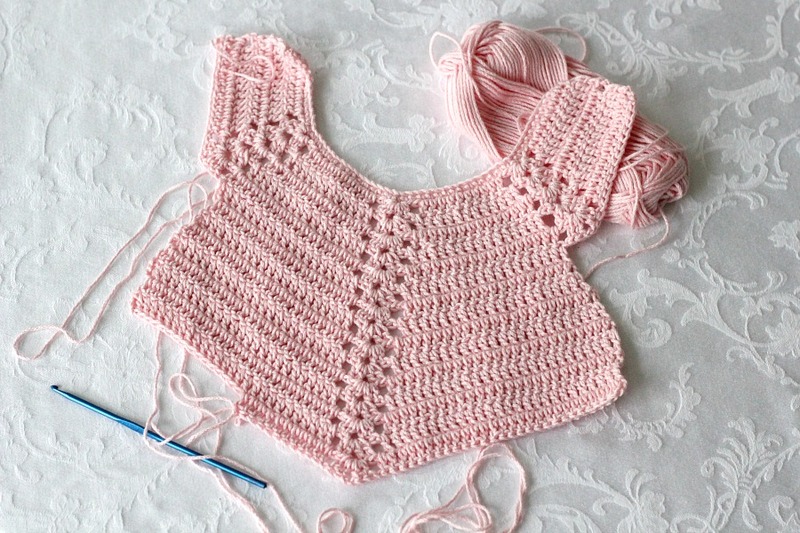 I have a new granddaughter arriving in Sept. 🙂 I may see if I can try to make one for her. Thanks for the pattern.